Two analyses of ecological research projects warn that natural processes in the soil increase the threat of global warming. 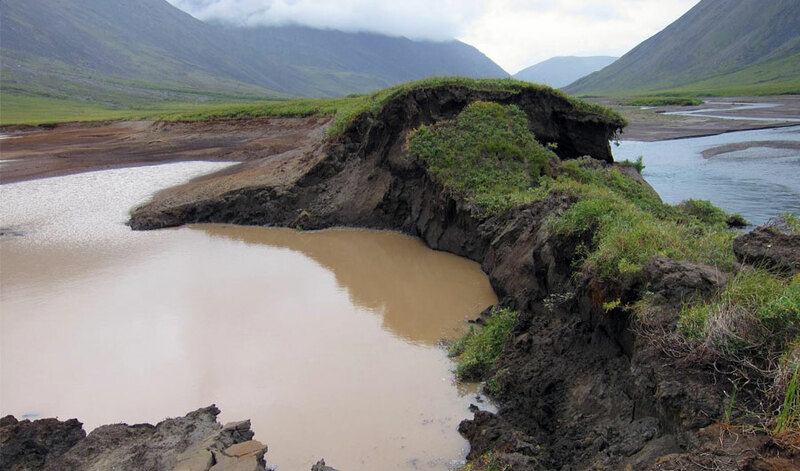 In Gates of the Arctic National Park, thawing permafrost weakened the bank of a lake, allowing a river to cut through and drain the lake to the sea. (Inside Science) -- While scientists who study climate overwhelmingly agree that human activities bear a large responsibility for global warming, two recent analyses have identified a surprising partner in the effect: Mother Nature herself. The analyses, which synthesize the results of 76 separate research projects, indicate that organic matter stored in the soil is releasing the greenhouse gases carbon dioxide and methane into the atmosphere at an increasing rate as the climate warms up. Respiration by plant roots and microbes in the soil converts carbon-rich deposits into the greenhouse gases -- and the process picks up speed as the soil warms up to around room temperature. The phenomenon, the researchers say, represents a feedback system. This vicious cycle increases concern that the rise in the climate’s temperature will pass 2 degrees Celsius (3.6 degrees Fahrenheit), a level that climatologists fear will set the Earth on a never-ending warming pattern. "More carbon dioxide will cause more warming and more warming will cause more carbon dioxide; that’s the loop," said Jianwu (Jim) Tang, an associate scientist at the Marine Biological Laboratory in Woods Hole, Massachusetts, who participated in an analysis published in the Proceedings of the National Academy of Sciences (PNAS) in November. The two studies also show that the effect is strongest in Arctic regions, which are already experiencing significant warming. That’s particularly worrying, said Joanna Carey, a postdoctoral scientist at the Marine Biological Laboratory, "because there’s a disproportionate amount of carbon stored in the Arctic." When temperatures are very cold, organic matter doesn’t break down. But as frozen carbon goes into a warmed state, microbes use it and release it as carbon dioxide. Carey is the lead scientist on the PNAS study, and also a member of the team responsible for the other analysis, which appeared in the journal Nature in November. The PNAS analysis undertaken by Carey and Tang examined the results of 27 experiments on the impact of global warming on respiration by plant roots and microbes in the soil, in several regions of the world. "We found a very consistent pattern. Soil respiration rate increases with rising temperature up to 25 degrees [Celsius],” Carey said. She added that the studies show no evidence that microbes are adapting to the warming by starting to reduce their respiration rates. The second analysis, headed by Thomas Crowther of the Netherlands Institute of Ecology in Wageningen, focused on the amount of carbon in the soil that’s available for exchange with the atmosphere. The analysis, which Crowther conducted while a faculty member at Yale University in New Haven, Connecticut, reaches a similar conclusion. The synthesis shows that the effects of warming soil depend on the amount of carbon in the soil. The analysis of 49 experiments "provides strong empirical support for the idea that rising temperatures will stimulate the net loss of soil carbon to the atmosphere, driving a positive land carbon-climate feedback that could accelerate climate change" and planetary warming over the 21st century, the report notes. Part of the concern stems from the fact that the Earth’s soil releases nine times as much carbon dioxide to the atmosphere as all human activities combined, Tang explained. In normal conditions the plants in the soil balance their output of the greenhouse gas by taking in large amounts from the atmosphere. The new analyses highlights the impact of global warming on tipping that balance -- particularly in a warmed-up Artic that will likely release more stored carbon than it can absorb with increased plant growth. "It’s not new information that if you warm soil you’ll lose carbon," said Susan Natali, an associate scientist at the Woods Hole Research Center in Woods Hole, Massachusetts, who did not participate in either study. "What is new is the synthesis to tell these complementary stories and highlight the importance of biological processes in thinking about carbon emissions into the atmosphere," she added. "Nature and human activity are combining to warm the climate." Both studies indicate that higher latitudes, and notably the Arctic region, are most vulnerable to the impact of soil warming. That’s because a huge amount of the carbon there is buried at low temperature in very deep permafrost. As the temperature increases, the process of release of carbon dioxide will speed up," Carey explained. The experiments that Carey and Tang examined involved warming of patches of soil, from a few square meters to 30 meters by 30 meters. "Environmental scientists artificially warm up the soil and ask what will happen," Tang explained. They use various approaches to achieve the warming. "They can shine infrared lights on grassland, to warm up the grass and some of the soil," Tang said. "Or they can bury a heating table in the soil to warm up the soil. There’s also passive warming, in greenhouses." In every case, Tang emphasized, the research teams measure respiration from the heated soils against that from unheated control samples of soil. Carey and Tang obtained details of the experiments they analyzed from investigators who run warming studies from all over the world. Many of the studies, Carey said, were unpublished. The 27 studies focused on nine different biomes, or ecological regions. Every case, they reported, revealed a consistent pattern: The amount of respiration increased with the temperature of the soil up to 25 degrees Celsius. Above that temperature, however, the respiration rates decreased with increasing temperature. That the Arctic region shows the most impact of this factor comes as no surprise. After all, the soil rarely, if ever, reaches 25 degrees Celsius in such high latitudes. According to Carey, increased respiration from soil probably accounts for some of the increases in the rate of warming in the Arctic observed in recent years. "The increase is due to a number of factors, including the loss of sea ice and changes in vegetation on land," she said. "But it also possibly stems from increased carbon dioxide fluxes from soil to the atmosphere. The relative roles of these factors are a bit uncertain, but they are all related for sure." Crowther also focused on experiments in a broad range of ecological systems, across North America, Europe and Asia. "We find that the effects of warming are contingent on the size of the initial carbon stock, with considerable losses occurring in high-latitude areas," he reported. Natali summarized the ecological understanding in light of the two studies’ conclusions. "We can safely say that increasing temperatures will lead to increased loss of carbon from the Arctic permafrost through release of carbon dioxide," she said. "The Arctic has been a carbon sink for tens of thousands of years. Now, a number of studies are showing it as a source rather than a sink of carbon." Natali sees one source of hope. "Because nature and human activity are combining to warm the atmosphere," she said, "human reduction of emissions will, after a lag, lessen the natural impact."